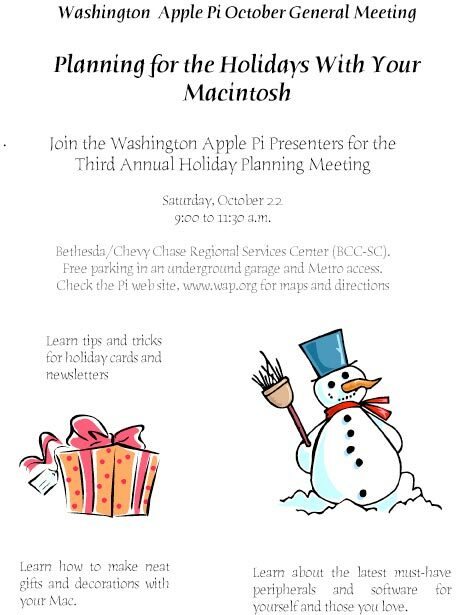 Washington Apple Pi is planning a Third Annual Holiday Planning Meeting for Saturday, October 22, at the Bethesda Chevy Chase Regional Services Center. Learn tips and tricks for holiday cards and newsletters. Learn how to make neat gifts and decorations with your Macintosh. Learn about the latest must-have goodies for your Mac and loved ones. The meeting will run from 9 am to noon on Saturday, October 22. It will be held at the Bethesda-Chevy Chase Regional Services Center located at 4805 Edgemoor Lane, at the intersection of Old Georgetown Rd and Woodmont Ave, adjacent to the Bethesda Metro Center. Google map. Mapquest map.